One place we visit quite a bit is a restaurant The Gentleman has been frequenting for years (decades, probably). The lack of common language doesn't seem to hinder things - every time Antonio, one of the brothers that have been running the place for about an eternity comes over every bit as enthusiastically to ask how we're doing. And only a short while later he comes over with gambas pilpil and pinchitos. That I think we might have had there every single time. There aren't many smells as scintillating as the scent of meat being grilled on the barbecue, filling the warm summer night's air, already turning to dusk. And there, at the tiny charcoal barbecue at the back of their restaurant's garden Antonio makes magic happen with their pinchitos. 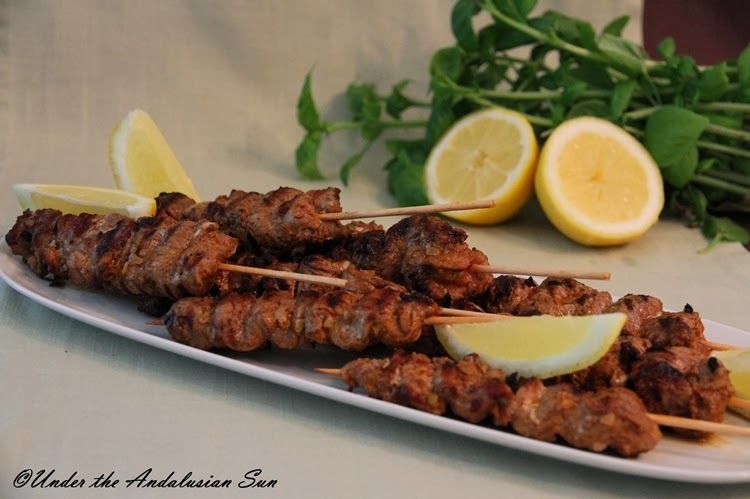 As the names suggests, these Moorish kebabs and the spices that go into them tell of the Arab era of our county and the way it's still reflected on the food eaten in Andalusia. Pinchitos are made with chicken, lamb, beeg and pork. There are numerous spice blends. Shops also sell ready-made mixes. One thing they all have in common is the use of cumin, coariander seeds, paprika and cinnamon. The mix listed below works well with pork, lamb and beef. For chicken I'd add at least curry and turmeric. And omit allspice and cinnamon. Ideally the meat should be left to marinate for 24 hours, but if there's no time for that, I have been known to rub the spice mix straight onto the meat and fried the skewers in oil (patience has never been one of my virtues...) This should be done after the meat has been skewered - otherwise the bits on the inside are left tasting dry and powdery as they don't come in contact with the oil and heat. I startby gently heating the spices on a dry, hot pan to tease all the flavour out before mixing with oil, but it's not mandatory. Mix the spices with oil. Trim the meat clean of any membranes) and cut into chunks or strips of your desired size. Traditionally pinchitos are quite small: the thickness is a little bit more than a thumb and the length around 15 cm. Let the meat marinate for 12-24 hours, turning a couple of times to make sure they're evenly coated. Thread into skewers (if using wooden ones, soak them for half an hour before grilling to stop them from burning), salt and pepper and fry either on the barbecue or griddle. Antonio serves these with tomato, onion and garlic salad drizzled with this deliciously sweet olive oil, but Pimientos Marinados (and tzatziki, of course!) make another good accompaniment!